Note: This is a downloadable product. A CD option is also available. Shakespeare's works are often difficult for students because the English language has changed so much since the time that these plays were written. Text "seeds" have been added to the plays to facilitate comprehension of vocabulary, phrases, and factual information that may be unfamiliar to students. 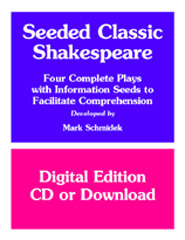 Seeded text helps students read complete editions of Shakespeare's works independently. Students have difficulty understanding the vocabulary, phrasing, and factual references contained within works that were published many years ago. By adding information seeds to the text, the students have a tool that they can use independently. Seeded text is a differentiated approach that can be used within the general education curriculum or in special education programs. Seeding provides an explanation for what is unfamiliar without interrupting the reading process. The reader does not have to leave the text to search for a dictionary or to ask for help. Vocabulary words are in bold and the meaning is in (parentheses) - His body vibrated from the weight and force of his imprecations (swearing) and he could string oaths (swears) with the facility (ease) of a maiden who strings beads.Factual references are shown in bold italics and the meaning is in (parentheses) - They're going to Richmond (Virginia: could be around the time of the three-day Battle of Chancellorsville in May 1863- two years before the end of the war), or some place, while we fight all the Johnnies (soldiers of The South). Challenging phrases or sentences are underlined and their meaning appears in [brackets] - Presently (Now), men were running hither and thither [in different directions] in all ways ...The youth sat up and gave vent to [made] an enormous yawn. Discount codes may not be applied to this item because it has already been discounted. This product may also be ordered on a CD by selecting the CD option.